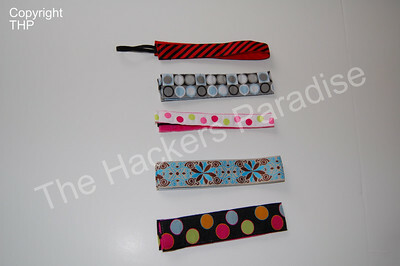 Here at The Hackers Paradise we are always looking for something new and fun for the golf course. I have been lucky enough to find some fantastic items that work perfectly for golf, but are also great for many other activities. Thanks to our wonderful readers we were introduced to another great company called Sweaty Bands, who make a fashionable multipurpose product. Sweaty Bands was created by a mother of three who is also a fitness instructor/personal trainer. Sweaty Bands was started so she could make a couple extra bucks to buy more music for her fitness classes. She started selling them out of her gym bag and only a lucky few were able to buy them. Now we are all lucky enough to experience this innovative product. Sweaty bands is a soft, flexible headband that keeps your hair in place and absorbs sweat. Not only do they serve a purpose but they are fashionable too. The key to these headbands are the interior lining, they are designed to soak up sweat and stay in place. There is nothing more annoying to me then when I am playing golf and the wind blows and my hair gets into my eyes. I equally hate it when I am running either outside or on the treadmill and my sweat soaked hair is stuck to the side of my face. I have tried other headbands before but they never worked like I had hoped. The elastic ones don’t stay in place, and the plastic ones squeeze my head and give me a head ache, not to mention that neither of them help with sweat. After a full 18 holes of golf, plus some warm-up at the range, the Sweaty Band never moved an inch. The most amazing part to me was that they really did absorb the sweat. Even on a hot sunny day in the Florida heat, my hair stayed dry thanks to that inner lining of the Sweaty Band. With hundreds of colors and patterns to choose from this nifty little headband is a great buy. If you are looking for a fun and fashionable alternative to a hat I highly recommend checking out Sweaty Bands. I almost forgot to mention how easy they are to clean, just drop it in the sink for a quick rinse, ring it out and lay flat to dry. With a retail price of $15-$18 USD I do think they are a little pricey but well worth it for someone looking to replace a hat or visor. To learn more about this company and see all the different options they have to offer you can visit their website at Sweaty Bands. Great review. Looks like an interesting product. These bands are so great!!! I get asked about them all the time whether I am wearing them at the gym or on the golf course!!! I love them!!! These seem a little high priced to me. Great concept and we all love the matching and coordinating, but these are the same price as a hat. Love the look and great concept. This will definitely coordinate an outfit. I too would love it if these were closer to the $10-$12 range. to suit those who dont have 13 dollars to spend on a headband when entering the site and chosing which headband to add to your cart it will ask you for a discount code type in ” fatty ” and youll get 10% of!! I love these! They’re very comfortable and have yet to be the only headband I’ve tried that doesn’t slip off my head when working out. I wear for running and soccer, and actually wore under my bike helmet yesterday. You can’t do that with a hat! I’ll try the discount the person mentioned above on my next purchase, but even at $15 or $18, I think they’re worth every penny!